Expect nothing less from him and his cohorts in the ‘peace at any price’, ‘Coexist’ and ‘J-Street’ institutions. The photo of Israel President Shimon Peres below is courtesy of Arutz Sheva/Israel National News and was taken at a recent Holocaust commemoration ceremony. 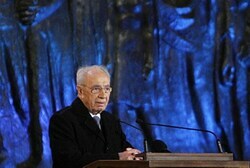 Remember those words: A Holocaust commemoration ceremony. And remember these as well: Israel President Shimon Peres remains a clear and present danger to the continued existence of Israel and survival of the Jewish people. President Shimon Peres appears to be leading a coalition of government officials, MKs, and public figures who oppose Israeli action against Iran’s nuclear program. A report on Channel 10 Saturday said that Peres has not only been expressing his opinion against a strike – he has been spreading his opinion at every opportunity, including at meetings with foreign dignitaries. Peres is said to have pressed U.S. Defense Secretary Leon Panetta on the point when the two met several weeks ago, with Peres stressing that attacking Iran would not be a good idea. Peres’ office had no comment on the story. Defense Minister Ehud Barak said in a weekend interview that Israel could not depend on the Americans to attack Iran’s nuclear facilities. Barak dismissed a pledge by U.S. President Barack H. Obama to move militarily against Iran’s nuclear facilities next spring if sanctions fail to stop Tehran’s activities. Barak said that there was no way for any leader to make that kind of guarantee so far in advance. In all that is holy and sacred, does not Israel President Shimon Peres have the wherewithal and capacity for processing the daily goings-on within the Muslim world ? And then there’s th……… Wait……… El Guapo is gonna “move militarily against Iran’s nuclear facilities next spring if sanctions fail to stop Tehran’s activities” ?!? B O O L E .. S H E E T.
Barack Hussein Obama (PBUH) will no more order an attack on his brothers-in-Burqa’d-arms than he would on The Democrat National Committee headquarters. Besides…… Spring of 2013 will more than likely be way too late. That link leads to an article, plus several others that will simply stun you. Please suspend your disbelief, because many millions are unaware of the level of pure evil being willingly submitted to by Israel’s President Shimon Peres and his political friends. This entry was posted on Saturday, August 11th, 2012 at 17:50 and is filed under Main Postings, The Constitutional Watch, The Media, The Second Amendment To The Constitution Of The United States..	You can follow any responses to this entry through the RSS 2.0 feed. You can skip to the end and leave a response. Pinging is currently not allowed. One Response to Of course he is.